This gorgeous 2 piece sectional is flying off the sales floor! We think you will love this new set just as much as our many happy customers who have taken it home. The Santa Fe can face either RAF (Right Arm Facing) or LAF (Left Arm Facing). This two piece sectional is upholstered with soft, marbled grey, leather looking material. It is softer than your typical faux leather, with the softness of suede, but with more durability. 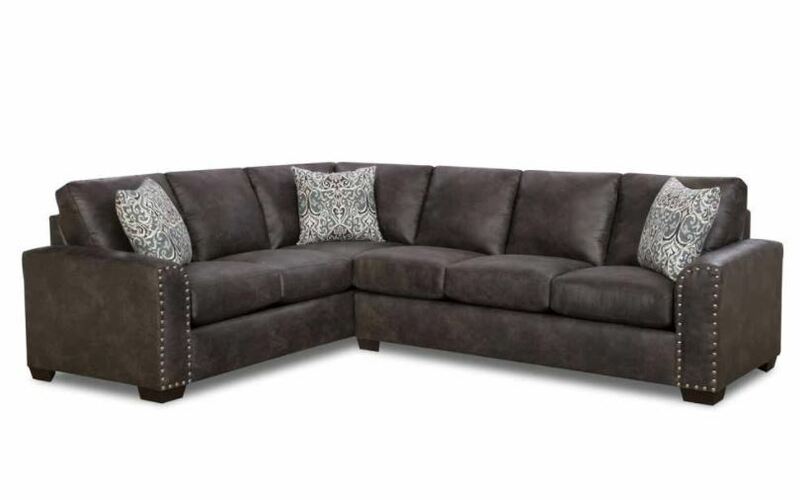 The detailed chrome nailhead trim gives a modern touch to this classic sectional. The pillows really tie it all together and match perfectly with the matching ottoman. They have a soothing, watercolor pattern in blue and grey. You can take this Santa Fe 2 piece sectional home today for just $898. The matching ottoman is available separately for just $198. Come check out our new products during our March Savings Madness this month. To get inspired with Spring home design trends: click here. Click here to find an American Freight store near you. For more new products, click here. It’s a perfect sofa to get it at a discounted price or something like that! Actually, I am inspired with Spring home design trends!